Title : AFRICÆ Descriptio Nova Impensis PHILIPPI CHETWIND 1666. Map maker : SEILE, Henry - Chetwind, Philip. Date : London, (1652) 1666. Size : 13.2 x 16.5 inches. / 33.5 x 42.0 cm. Description :This map is a close copy of John Speed's map of Africa of 1626 with the placenames and text legends in English. The placement of sailing ships, sea monsters, and even much of the lettering conforms to Speed's map. The geographical information for this map is also taken from John Speed's map. This map appeared in the first edition of the Cosmographie published by Henry Seile (? - 1662) in 1652 along with maps of the world and the other three continents. The author of the Cosmographie was Peter Heylin, who sometimes has the attribution for this map. This map was engraved by William Trevethen (at bottom left of the map: Will: Trevethen. Sculp.) who also engraved the other three continent maps. Sometime prior to Henry Seile's death in 1662, Philip Chetwind became involved in the book's publication. For the edition of 1666, Chetwind replaced Henry Seile's name on the map of Africa with his own name. This is the second state of the Seile map. An Early English-Language Map of Africa. Reference: Betz # 83.2. Betz, Richard L., with Penelope W. Betz. 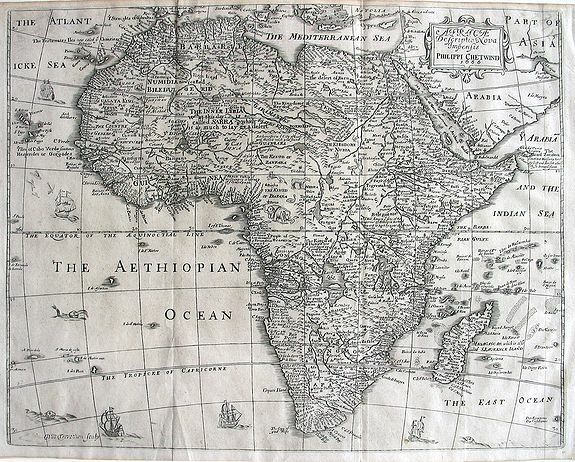 The Mapping of Africa: A Cartobibliography of Printed Maps of the African Continent to 1700. 't Goy-Houten, The Netherlands: HES & De Graaf Publishers, 2007. Condition : Very Fine Condition. The map was folded to fit into the book, but the folds are all solid. With somewhat narrow (but complete margins) as issued for the book.